SRM B. Arch/ B. Des Admissions 2018 - The application process for the admission into SRM B. Arch and B. Des admissions has started. Candidates can fill the application form through an online mode. However, the submission of the form can be done after payment of the fee either through online as well as offline. For complete details regarding SRM B. Arch/ B. Des Admissions 2018 like eligibility criteria, application process, selection process and contact details candidates can go to this page. These two programs are offered in these three campuses of SRM. The admission in the B.Des course will be based on the qualifying exams, whereas the basis of admission for B. Arch program will be NATA. 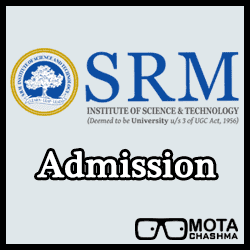 There will be no entrance test for these two programs conducted by SRM. The duration of the B. Des program is 4 years and the B. Arch program will be of 5 years. Candidates must have secured the minimum total aggregate of 60% in 10+2 or its equivalent. Candidates must have secured minimum 50% in 10+2 or equivalent in Physics, Chemistry and Mathematics and 50 % total aggregate. Candidates need to qualify for National Aptitude Test in Architecture (NATA) which will be conducted by the Council of Architecture. The application process for the SRM B.Arch and B.Des admissions has started. The candidates seeking admission in B.Arch and B.Des course in SRM are suggested to follow the link below. It is the responsibility of the candidate to ensure that they are eligible in all manner to apply for the admission. STEP 1 - (Registration): The first step to fill the online application form is registration. Here the candidates need to get themselves registered by providing the basic details like name, email id and contact number. STEP 2 - (Verify Email): After registering themselves, candidates need to verify the email id that they provided at the time of registration. All the further communications will be done through this email id, so candidates need to provide a valid email id here. STEP 3 - (Filling the Online Application Form): Once the verification gets done, the candidates can now start filling the online application form. Here they need to provide all the necessary details like Personal details, Educational qualification and Other details etc. STEP 4 - (Application Fee Payment): After providing all the details candidates need to pay the application fee. The application fee can be paid either online or offline and will be non-refundable. STEP 5 - (Uploading Required Documents): After completing all this, the last step will be uploading the required documents. Here candidates need to upload their photograph, signature etc. in the required format as instructed. After filling the application form, the candidates can submit it against the payment of fee either through online as well as offline mode. The candidates who are making the payment through offline mode need to download the application form and send it with a DD drawn in favour of SRMIST, payable at Chennai. The candidates in order to complete the application process need to pay the application fee. The amount of fee is different for the online and offline application form. Therefore, the candidates are suggested to make the payment of the requisite fee keeping the mode in mind. The admission in the B.Arch program will be done on the basis of the rank secured by the candidates in National Aptitude Test in Architecture (NATA). No separate entrance examination will be conducted by SRM Institute of Science and Technology for admission in this program. However, the candidates have to fill the application form for admission to B.Arch programme. For the B.Des program Admission will be done on the basis of fulfilling the requirement of minimum marks in the qualifying examination. No entrance test will be there. The admission in the B.Arch program will be based on NATA. So, here we are giving the exam pattern for NATA. It will be divided into two parts, Part A and part B.